Attention blog readers! This will probably be your only chance to see a Halloween card here. I'm not a Halloween person. Although I used to love to get dressed up when I worked in an office and we were allowed to do that. At home, we have only had trick or treaters once in over 20 years. My step-grandchildren live far too far away for us to have fun on Halloween with them so I'll just be a scrooge for this holiday and move on to my favorite - Christmas! I am sending this off to a special little trick-0r-treater. I knew I wanted to make at least one card using the birds. When I got the Cricut as an early Christmas (again, favorite holiday!) gift, I added the landscape cutout from the Plantin Schoolbook Cartridge. (It is made with the grass button.) 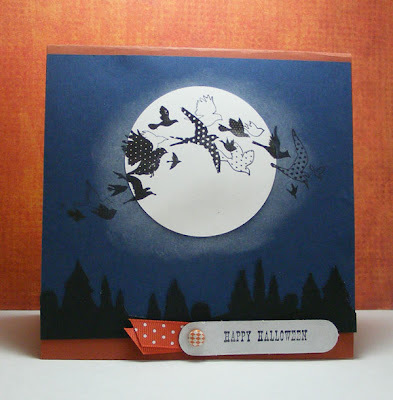 To get the moon's glow, I used Stampin' Up! pastels in white. 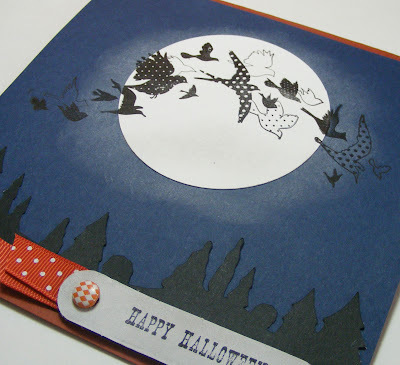 Ink: Basic Black and Whisper White to color the chipboard by SU! Ribbon: Dusty Durango by SU!